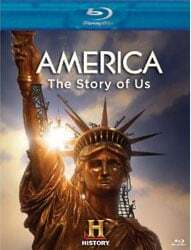 America: The Story Of Us is 12 episode mini-series that tells the story about America. Each episode focuses on certain important events and how this country became to be. Random celebrities, newscasters, reporters and historians comment about certain things that the episode focuses on. Episode 1 shows us the settlers coming to North America and later on, rebelling against the British Empire. Episode is about the American Revolution and George Washington’s fight against the British. Episode 3 is about going out west, Episodes 4 and 5 focus on slavery and the Civil War. Later episodes focus on the trans-continental railroad, the Statue of Liberty, skyscrapers, steel, car development, The Great Depression, World War II, and modern times and the tragic events of 9/11. I really wanted to see America: The Story Of Us but never got around to it until now. The History Channel has been producing a lot of quality stuff lately, including this mini-series. This isn’t particularly the best mini-series ever but it’s done very well. I loved watching all the reenactments of events and I’ve grown to appreciate American history in my later years. Obviously they can’t cover every little detail in American history but they do a fair enough job that teachers should be showing their students this. I think it’s important for kids to read the books about this stuff, but also see documentaries, mini-series and movies like this one. But with that said, The writing and dialogue is pretty bad and laughable at times. The series was narrated by actor Liev Schreiber, who sounded like he was doing some old man narrator impression or something. At times it didn’t even sound like him. Plus the stuff that he kept saying over and over throughout the series was just cringy. You hear the phrase “change the course of history forever” at least 15 times in the first episode alone, but then you hear it again throughout the series. Clearly there’s other things to say than that. You can create a drinking game just based on that; people will be plastered by the end of each episode. I liked the interviews with the various people they had on the mini-series but felt like they just randomly asked celebrities to be on the show. Why would I give a crap about what P Daddy or Sheryl Crow have to say about American history? I think they should have had more people that were historians and experts in the field of history than just a popular celebrity to give their opinion on history. With all the negatives I had about the mini-series, I still enjoyed this one a lot. After watching one episode, I wanted to watch another. The Blu-Ray looked excellent and was very sharp. The bonus features included additional scenes from select episodes but I didn’t get a chance to see them all. I think if you can get past the cheesy dialogue, and unnecessary interviews with celebrities, this one is fun to watch!